By Caz | December 21, 2018 | This post may contain affiliate links, which means we may receive a small commission, at no cost to you, if you make a purchase through a link. Read our Disclosure. Is it easy to make money as a travel blogger? What’s the best way to make money travel blogging? How much money can you earn as a travel blogger? What are your financial independence goals? 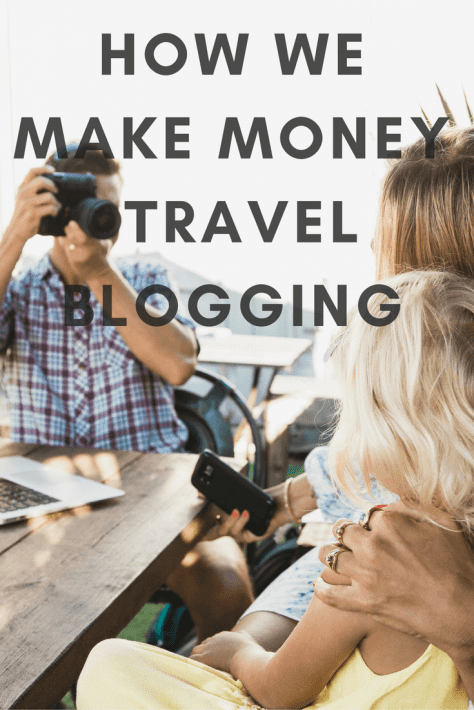 How do we make money travel blogging and get paid to travel? Let’s face it, most people who see our travel lifestyle, desire to get paid to travel. Just like I wanted to earn money traveling every time I watched another TV episode in Australia of Getaway or the Great Outdoors. I was shocked when I’d hear behind the scenes tales of just how unglamorous and exhausting getting paid to travel was. Yeah right! It didn’t matter how exhausting it sounded, I knew that was the life for me. Getting paid to travel was more attractive than teaching – you want to know exhausting! It turns out travel blogging is exhausting, and really not very lucrative, especially in the early years of your online business, just like most businesses. BUT, it IS a damn sight better for me than teaching and I love it. I’ve never worked longer hours and I’ve been ejected so far out of my comfort zone that I no longer recognize the planet I’m on, nor the body I’m in. Travel blogging is a wild ride and I’d do it all over again – this time much smarter! So, firstly let’s answer some commonly asked questions about how to make money travel blogging and get paid to travel. These are the questions we consistently get in our inbox from people wanting the travel lifestyle a travel blog can bring. Absolutely you can make money off a travel blog. You can make money off almost anything, either directly or indirectly. It’s incredible the doors that can open once you build an audience around something, and it’s amazing the number of people I’ve met who make money off their passions. The best way to earn an income travel blogging is by doing something you love and are good at. But you’ve got to earn it. You’ve got to build a foundation, a brand, an audience, and a product or service. You can’t build a skyscraper on a one-inch slab of concrete. Build your foundation! No. But it could be easier if you learn how to create a business and make money travel blogging from the start. There’s a learning curve and it takes an investment of time and commitment like any business. It involves a lot of smarts and learning from the right people. We’ve made huge mistakes, but over the past year have figured out how to do it the best way for us, and there will be a best way for everyone and a different business model for you depending on your skills, time commitment, goals, location, travel experience, and demographic. Different doors can open whether you’re a family travel blogger, couple or solo. Whether you’re based in Australia, Europe, North America or elsewhere. Whether you’re strong at photography, or writing, or video. There are many variables at play. We’re always innovating and growing and adding different income streams to our travel blog and using our data to evaluate how we’re making money travel blogging, what’s working, and what needs to change. Experience, and having the right teachers helps immensely. I want to be upfront with you – travel blogging takes a lot of time and energy and other blogging niches appear to provide a better income. It also takes an investment of money – but much smaller than if you were building a brick and mortar business – but still you’re going to have costs. If you treat it like a business from the get-go, and that means investing in education, tools, and resources, then you’ll get paid as a business, not as a hobby. Think like an entrepreneur, not an employee. It’s a huge mental cross over and if you’re not ready for it, it could take you out of the game. You’re no longer trading time for money, but trading value for money. Grow to the point where you have a lot of value to exchange. That’s the best way to make money as a travel blogger. Put in the hard yards to establish your credibility, build your value and build a community. If you don’t, you’re building a business on peanuts and they won’t get you too far out of the jungle. It took us two years of intense work before money started flowing into our travel blogging business. It’s only been the last year that we’ve seen a healthy profit. The best way to make money travel blogging depends on what skills and value you can bring to the table – play to your strengths. Be creative. Be different. Explore many different income avenues. There is no simple answer to this. Too many variables at play. It’s totally up to you and the audience you build around your brand. I suggest you set big goals and then work towards them step by step. I think the higher your goals the more you’ll grow and the more you’ll eventually earn. Some people like to set more realistic goals. I just put out the big numbers and then believe I can move closer to that. You know the saying, shoot for the moon and land amongst the stars! 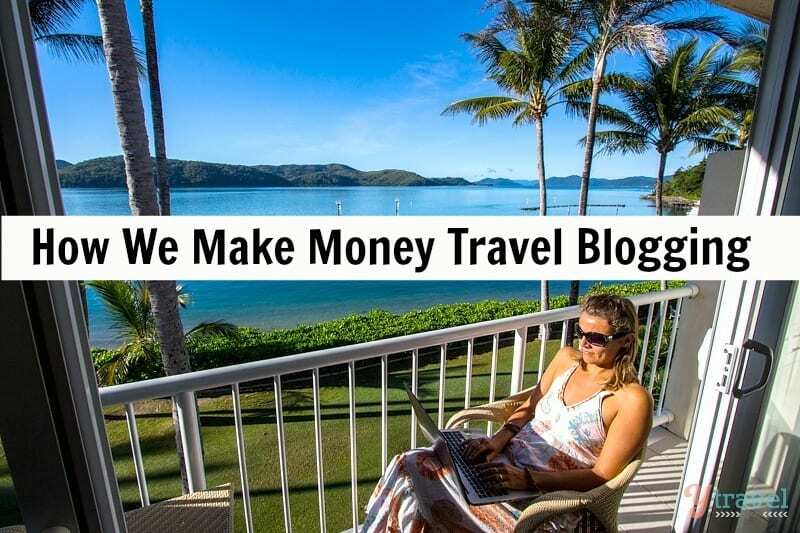 Some travel bloggers make a few hundred dollars a month, some a thousand and some even more. The best travel bloggers earn multiple six figure incomes from their travel blogs. The majority of travel bloggers can earn enough money for them to live well in developing countries. This is a very worthy goal. As long as you are happy and living a good life, then it doesn’t matter where you live or how high your income can grow. 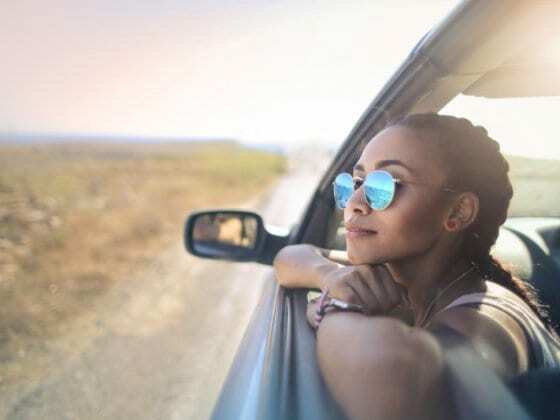 If you can reach that state of happy financial independence by living in a country where your expenses are much lower, then that could be a raging success. Work for the lifestyle you want. But for me, especially with our kids, I didn’t want to have to live in a developing country to hit financial independence. I wanted to be able to earn enough, no matter where I lived. That was the whole point to us starting a travel blog in the first place – to have time freedom, to be location independent. We wanted the freedom to live wherever we choose. That involves being able to survive, as a family, in a place as expensive as our current one – Australia. And we have reached that level now. We earn six figures because of our travel blog. This is not normal, it’s the top tier level – BUT, and this is one of my life’s mantras – if we can do it, so can you. Adopt this as your mantra too. If someone else has done it, it’s evidence you can too. Now all you have to do is learn and carve out your own path AND why not try and do even better? It’s exactly why we share this information on our travel blog. We want you to believe you can do it and we want you to go out and do it too! You can achieve a full-time income from your travel blog when you focus on longevity, establishing your authority and credibility first, and building a loyal following that you give a lot of value to. You’ve got to help your peeps believe in their own dreams and help give them what they need to do it too. We are not big believers of having one income stream. We like multiple income streams. It’s safer. Before I started travel blogging, I once had 9 part-time jobs. I wasn’t taking any chances if one of them should get all plugged up. Besides, I hated the box of a ground-hog-day job. The thing you must understand – and this ties in so well to the value thing – you will not make much money OFF your travel blog (you can but you need super high traffic numbers) but BECAUSE of your travel blog. Blogging can open up many doors for you, but they won’t open until you’re established as an authority figure and have a strong readership base. If you want this to be a long-term lifestyle then treat it as such. I see far too many travel bloggers getting into this game just to get free trips so they can travel. That might be all that you want and that’s fine if you do it in an ethical and credible way, but it’s not a viable long-term business plan. CAVAET: Take it from someone who travelled for 12 years before starting a travel blog (and then getting free trips and getting paid to travel) Free press trips are the WORST way to travel. If you just want to travel the world for free, and you have no higher purpose for starting a travel blog, then don’t start one! It’s too much time and effort. Get our travel eBook, and discover the many other amazing ways you can get free or cheap travel. It’s less responsibility and WAY more fun! If you want to make money as a travel blogger, you need a long-term business plan, not a free ride. Back to how we make money travel blogging. Man, this took us 3 years too long to dive into this income stream. I had the book 2/3 written before we even started the travel blog. It was my damn insecurities and fears that got in the way. Creating your own products or services is a stable way to earn an income off your travel blog. B-School really helped me to get clear on the product launching process, and because of it, we now have two eBooks published, How to create the travel life you love and Step into Sacredness: 12 principles for creating the life your soul yearns for. I’ve just finished my exciting 30 days to Money Mindfulness – helping you develop a better relationship with the stuff that will help you travel more! I have my premium training: How to move from Blog to Business and I have collaborated on a course with my business coach and his wife called Confidence Igniter – it’s all about gaining confidence and control in your life – essentials for success and happiness in any aspect of your life. I know what we do looks like a lot of fun and it is, but we also do a lot of work behind the scenes promoting destinations. We work with destinations to promote their experiences via our travel blog and social channels. We work with them to choose activities, experiences, and destinations that we know we’ll enjoy, that are of high quality and we know our readers will be interested in. We don’t participate in campaigns that don’t fit with our brand or readers, and very rarely go on group campaigns with other bloggers or media. We just don’t think that it best fits with our travel story and we just like to do our own thing. Yes, we do sponsored posts, and we’ve been doing them for three years now. A few times a month we’ll have a sponsored post published on our site. This is when a brand wants us to promote their product or experience for any particular reason. Again, we choose carefully based upon the criteria above. We’ll share products or services we understand, believe in, would use ourselves and we think is valuable to share. And we disclose, and so must you. If you don’t, trust me you’ll get called out and will lose credibility. Sponsored posts are basically like an advertisement that is written by us. Sometimes these may come in the form of a sponsored social media update as well. Something I’m really enjoying lately is public speaking. I was a teacher for 15 years so have no problem getting up on stage to share my thoughts and experiences. It’s definitely something I want to do more of and am really digging into to sharpen my abilities in this area. Lately, I‘ve been presenting at conferences organized by tourist boards, but have spoken at several blogging and social media conferences such as Problogger and SoMeT. Some speaking gigs are paid while others aren’t. It’s a case by case basis depending on the packages offered. And it has to be a pretty awesome package for me to leave our road trip and family if they want me to speak without any compensation. We have a private mentoring group that is connected to B-School. This technically falls under the affiliate stream of income, but I put it here as we actually offer a mentoring bonus instead of just taking the affiliate commission and sending them on their way to fend for themselves. So it’s a fair amount of work that we put into it. We offer coaching calls where we share our tips and insights, and we have an active Facebook group where we answer questions from the Dreamer Fools and help guide and support them. (They are such a cool group btw!) We’ll be opening this again in Feb next year and will have some exciting bonuses to go with it. We also do the odd coaching/mentoring call for people who have requested it. Affiliate marketing is one of the best ways to make money from your travel blog because you only set it up once, and the income keeps coming in forever more. It’s passive income and is where you find your true freedom. Now there is work required and you do need to have traffic and an audience who trusts you, and you want to be honest with your affiliate marketing to maintain that trust, but it’s the best form of leverage when making money blogging. Affiliate marketing is where you promote other people’s products and services and receive a commission. We recommend products or services that we personally use, like and trust. There might be the odd few that we haven’t had personal experience with, but we know the source as a highly trusted and reputable one. We have affiliate partnerships with Booking.com, Airbnb and RentalCars.com We pretty much only promote these two companies as we feel they are the best, we use them all the time ourselves, and it’s less confusing for you as our reader. We don’t want to be shoving 13 different accommodation booking sites in your face just so we can make money. We’d rather give you fewer options from a trustworthy and valuable provider. If you want to learn how to make money with your travel blog through affiliate marketing our friend Michelle’s course, Making Sense of Affiliate Marketing, is the best out there. Learn how she went from $0 to over $50,000 a month in affiliate income. That’s freedom. We’ve done the course and loved it and learned a lot! I wish we had it when we first started as we’d be making a LOT more passive affiliate income now. And if there is one income earning strategy I recommend you implement straight away, it’s affiliate marketing. You won’t get immediate results, but it will pay off i n the long term. Six years later you won’t be like us, face palming yourself as you realise the thousands of dollars you’ve left on the table and have to spend the next year going back through hundreds of posts to implement the strategies. We have various freelance content creation gigs running in the background. I wrote for the Kidspot Going Places campaign sponsored by Nissan for 2 years. 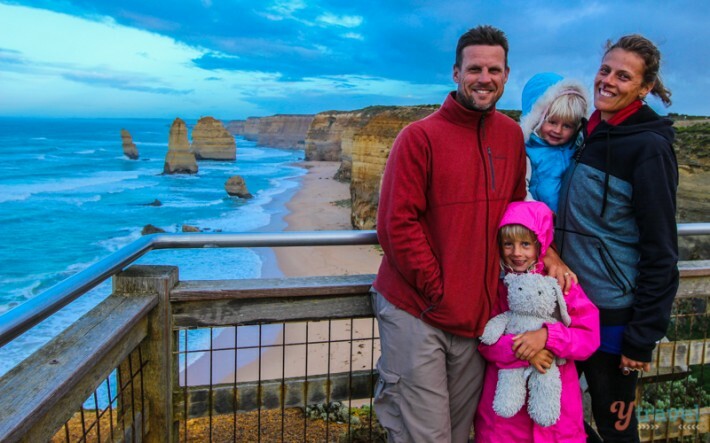 Kidspot is the largest parenting website in Australia and I wrote a column on family travel, which has just ended. Craig currently writes two articles a month for HomeAway and we’re about to start writing two posts a month for the Destination NSW blog. We also write for Skyscanner. We’ve created videos for tourist boards and often do some ad hoc freelance writing gigs here and there, including some print. Just to give you a few more ideas. Here are some other streams we’ve considered tapping into, or known of others’ who are making money from their travel blog in these ways. There’s a huge market here for us to be able to help DMO’s and tourism companies with their social media and blogging strategy. Think about what skills you have learned through blogging. How could you then empower other businesses to do the same and improve their visibility? If we had the time we could easily organize and manage blogger brand campaigns. We know how to make them work best. There are plenty of these groups popping up now that manage these types of relationships for travel bloggers. There are plenty of mobile travel agencies. Travel blogger Chris from Backpacker Banter has just launched Epic Gap Year which acts like an online travel agency for epic experiences around the world. Cool idea. You could become your own tour guide. Wandering Earl offers group tours around the world. As a seasoned traveller, he is more than experienced in showing people how to have similar experiences to what he does. The Planet D and Gary Arndt have also hosted tours. Would love to fulfill my dreams of being on Getaway. Love to have my own film crew following me around so I could just enjoy the adventure and relax!! Our friends from Places We Go do this! This is not an exhausted list of income streams. There are others creating and doing different projects all the time. It will be up to you to decide where your focus should be. Can you add any helpful insights or suggestions on how to make money travel blogging? As usual a comprehensive article Caz. Travel is definitely a market unlike any other. I see so many people take a gap year or some other extended trip, start a blog and then think they can make a career out of it. While this may be true in theory, the fact is most blogs fall by the wayside when the trip is over, therefore never really reaching any decent sort of monetization. You mentioned that it took 2 years before seeing any real returns and this is why only a handfull of blogs are on your level. Just look at the other blogs you have mentioned – Wandering Earl, Planet D and Gary Ardnt have all built their brand over a number of years. The only thing I would like to add is to find niche. If I was to ask anyone what your blog specializes in, it would be easy to see that you focus heavily on travel with kids. That is not to say you can’t grow out of your niche, but you need to start somewhere as the influencer in that space. I couldn’t agree more that it’s important to pick a niche, and stick to it, especially on a topic as broad as travel, or even budget travel. The more specific, the better. Thanks Dave and Michael! Definitely agree with you both even though we haven’t done that!! It was so hard to niche us down as we’ve had such extensive travel experience and our story has evolved with us. It’s made what we do to be quite the beast and difficult to manage, but we’ve made it work and recently figured out a good plan to manage it better. We have the traffic to make it work. But, I’d definitely recommend newbies niche, but leave room for their brand to evolve as they do. Great to hear you say the niche thing Michael. I came home from a bloggers clinic for Dutch and Belgian travel writers last night and they kept on mentioning it, too. And yet still I know plenty of blogs who have not defined their niche. When we started blogging we wrote about anything and quickly realised that wouldn’t work as there are already plenty of those blogs around. Even though our niche is small and not for everyone we appreciate returning visitors that actually have a feel for what we do. Thank you so much for your generosity, mindfullness and gifts you give us in every article you write. You are really inspiring me because I have the same values than you. I have a new travel blog and I just want to be happy traveling and sharing in it. I write a french blog and I don’t find such a great blog than yours in french. I nearly read every new article you write even if I am french speaking and not bilingual. I am used to write articles for many years in my blogs and I know that only heart written articles have success. Thank you so much Dominique! We really appreciate it. Heart-centred living is where it’s at! Great tips! I’m a big fan of diversification as well. I don’t think any travel blogger has made a fortune in just one outlet, and all who have succeeded had their hands on multiple projects (although, the word “fortune” is relative here since most travel bloggers value freedom over money). Everyone established themselves as bloggers first, but I think the service/product offerings they’ve put out have only gone to strengthen their credibility as experts. It is a self-propagating circle at times but requires that base expertise in every single case. This is an AWESOME article! I feel like you’ve written it for especially us. Whilst we’ve built an amazing website that’s now the go-to for fabulous people planning an outback trip, we really struggle with monetization. We don’t even need anything like 6 figures to survive -although our totally amazing jobs bring us well over this amount, and provide content as we really do stuff that others only dream of- but we’d like to website to be our main income within the next 2 years. So THANK YOU! And yes, B-School is in the diary as is Donna Moritz. Oh so glad you’re considering B-School! You’ll love it. You’ve got a fantastic niche! I’m seeing you do great things on Instagram lately! Thanks for the tips and I hope you continue to have success with these ventures, especially your new book! Yes!! I try not to think of the money I could have earned working the same in other jobs!! I think its essential you love what you do, and when you find that you’ll happily work for less. But, still have the intention to earn more as I think it’s essential every person earn a valuable income for doing what they love and giving value in exchange for that. I see you did a surf tour with Mojo Surf. I grew up in the same town and hung in the same circles as the owner, Nathan Folks. He’s a really great guy who’s done amazing things with Mojo. That’s awesome! I really loved our surf lesson! I was only able to do it for an hour as it was part of an organised tour with Contiki, but I can imagine it would be a really great place to stop for a week or so to really get to grips with surfing! I’d love to see you with a segment on Getaway!!!! It would be too cool!! I’ll leave it up to the Universe to sort out for me!! Wow that’s lovely to hear. Thank you! Keep working on the dream. Think of it like this – You’re working full-time on your income, and part-time on your fortune! Step by step is the best way to get there! Interesting stuff. I know people who have less traffic than me who are making way more money, so I am definitely doing something wrong :/ I guess I just don’t really have that much of a business head. It doesn’t always have to relate to traffic though. It depends on the monetization model that you work towards. I know lots of people who have far less traffic than us and make more. I agree that the niche is so important- it’s what helped my blog grow faster than I thought it would. I wanted my blog to be about typical solo female travel & budget backpacking… but I live in India and travel A LOT in India plus I get to stay at nicer places because it’s cheaper here, so I noticed all my traffic was driven from people googling about backpacking India… I recently changed my tagline from “glamorous travel on a backpacking budget” to “glamorous travel in India (and everywhere else)”. I guess people picked my niche for me. Thanks for all your tips! Perfect! I love how you let the readers drive your decisions. It’s definitely how we shape what we do here and have had a huge re-structuring of our site as you’ll start to see in the coming months. Thank Caz, this post is very helpfull for me. God bless you and your family. Thanks for this comprehensive guide. It’s always interesting to see how other travel bloggers are earning money and inspiring to try some new techniques. I started to earn a full income exactly after 1 year of blogging, another 6 months later I told my partner to quit his job and we moved to Asia. We decided to live part time in developing countries and it allows us to save money and to enjoy the better life quality for a small price. I’m really proud of you guys, making a 6 figure income from travel blogging is absolutely amazing! More power to you all and please, keep inspiring us! Thanks Sab! You’ve had great success in such a short time. It’s all about quality of life and it’s so great that a travel blog can help people get that from anywhere in the world! Great article, thanks for sharing! One year ago, ytravelblog was one of the blogs I stumbled upon and motivated me to take my “blog for friends and family” to the next level. One year later I’m making a little bit of money. I’m not planning on becoming a fulltime blogger (I love my tourism job too much for that) but a bit of extra money makes me able to travel more and share those experiences with my readers. It’s great your blog can help give you the extra money you need for your fun stuff. I think it’s really important that people recognize there are so many ways you can bring more money in so you can have those things you really desire. Thanks for sharing antonette, I’m so glad we could help inspire you! Thanks for the article. Love your “it’s a marathon not a sprint” qoute. Like a lot of peope I want instant succes. A good reminder to just keep on doing what I like and take it easy. yeah it’s really hard. I’m a big thinker kinda person so I see it and then want it straight away. I have to breathe really deep and remind myself to just enjoy the journey and let it all unravel rather than pushing to get it here now. Hi Caz, thanks for sharing all this valuable information with us! I love your posts about travel blogging and digital lifestyle. I will be waiting for your travel blog course! I started my blog two years ago but it is only a hobby and unfortunately I can’t put the time that I want in it. I already realized it is really hard work and I will do the best I can given my current time limitations. Your post are always so inspiring and full of helpful information. Thank you! No worries! Just always remember you can only do the best with what you have from where you are. That;s something I always like to remind myself of when I get stuck and feel like things, such as time, are against me. I love it when you write posts like this because they’re always so inspiring. I love seeing how others are growing their businesses because it just lights a fire under me and assures me that I can do the same – especially as I’m fine tuning my products in preparation for launch. Like you, I’d love to eventually be able to curate content for tourist boards and DMOs as well as delve into consulting down the line. Just want you guys to know that I’ve appreciated your mentorship through the DF group on Facebook and being able to pick your brains for insight/advice. Keep inspiring us! Thank you so much Dana! I’ve loved our Dreamer Fools group!! I think its so important to see how others grow their own business. It really helps in those moments when you feel like you want to quit. I really believe if someone else is doing it, it’s evidence that I can do it too. You’ve just got to believe and then learn from them! Another well written and helpful article – as usual! I would love to see a list of seminars, and meetings for bloggers who want to take classes, hear others speak and exchange ideas. Is there a yearly International get together or conference? How about regional conferences? There is TBEX – that happens once a year in North America and Europe. There’s also Problogger in Australia, which is my favourite one. I always learn so much from this conference and I love how blogs from a variety of niches are represented! I always learn a lot from what those in other niches do. Oh they are! It’s exhausting and you don’t have time to fully absorb what’s so great about the area! Excellent and comprehensive article, Caz. Like you – and probably many others – I “learned by doing” and made many mistakes. One thing, however, was very clear to me from the beginning: I had to build a brand, credibility, an audience and a network. I only half agree with you that launching a blog only to get free trips is not a good idea. travel. As you say, blogging is a lot of work. But I’ll add… If you do it seriously and professionally. A lot of people do it like a hobby, to score a few freebies, and that’ it. And many tourism boards and tourism operators apparently are still happy to host bloggers providing very little value added. It’s changing, though. And that’s good because it means that people working hard and professionally will be able to get properly paid. Yes. The industry really need to get better at vetting who they work with. There’s a tendency to just jump on board because they hear its valuable and want to check off the boxes, instead of taking some time to research and plan it first. Those who have the solid foundation in place are the ones they will eventually come to. Wow I’m so inspired by your journey. Thanks for sharing the tips. Having an entrepreneur mindset is very important in this blogging business. It’s absolutely not easy but anyone who is willing can do it. Great article! I’ve really been trying to focus in on my niche and define my brand this year. My blog was so broad when I first started!!! It’s so important to know how you best serve and who the people you are talking to are and what they need. Yes and you are putting in a solid foundation Brenda! You’re going a lot of great marathon training!! Loving all your latest photos from Italy. As always I really enjoy your honesty and insight. There is little doubt that you work incredibly hard and have earnt the success you now reap. Full credit to you both. I must admit that I’ve never sought out a press trip, it is not what I do nor am I interested in. I’m also trying to grow my audience rather than trying to communicate with advertising agencies. If they contact me then yes I’m more than happy to consider what they have in mind. You did mention media kits. I’ve been sending them out when people have approached me yet I find it frustrating that they never actually read them! They then ask a string of questions which are already addressed in the kit. I know I have to service them and be very polite yet their approach is very time inefficient. I’m approaching my 2 year blog anniversary. I know you’ve been at this a lot longer than me. However my social media followings, subscribers and traffic are much lower than I want them to be. Any advice? I do know that I should offer a gift/freebie which I’m thinking of devising. Yet others who don’t offer anything seem to be excelling in this way and I need to learn more from them. Thanks again Caz for all you do for us. Oh yeah we have that problem with the media kit too!! It is frustrating. Social media is really hard. You just have to be persistent and post good stuff that your community want. Make it fun and engaging. Ask a lot of questions and share inspirational content. Consistently good content is key. Make sure that it has your keywords in there so you can capitalize on search traffic. It took us a good three years before we started seeing search traffic benefit and now it drives a lot of traffic to us. All we did was produce good content that people wanted and we focused a lot of guest posting. You can definitely offer a gift or freebie. HAve some sort of free ebook or other bribe to get people to sign up to your email list and focus on giving them a more personal connection with you. Just be careful with the giveaways because it will often attract people who just want to win and don’t care about what you have to offer. It’s best to have subscribers and readers who do want to be there. The best way to increase your numbers is to focus on giving the best experience to the ones you already have. I think things tend to grow organically then because you are less worried about the numbers and more about the value you’ve got to share. And of course Keep believing in yourself! Thank you so much Caz. I really appreciate your detailed and encouraging response. I know it is a long haul thing, just every now and then I need a pick me up. I’m trying to be more active when I can “socially”. Always a time balance but as a part timer rather than full timer I need to keep realistic targets. Thank you ever so much again. Like everyone else here, I really appreciate all that you do and share. Love this post! Thank you for putting it up! Thanks so much for the comprehensive breakdown. The best take out for me is that “it’s a marathon not a sprint”… best advice to a newbie like me. Thanks. Yep! Lace up those boots! Great post! It’s always inspiring to read other travel bloggers sharing their tips. For me, one of the best things I did was take last year’s tax return and invest it in myself, and the blog by hiring a designer I loved. It was tempting to pay off some of the credit card instead, but much smarter in the long run to spend it on the blog. I have a feeling she’ll pay me back. Oh good investment. I think investing in anything that will make you grow is a smart choice. And sometimes that might mean delaying the credit card, you’ve just got to work out what is best. Design is key. We never realized in the beginning how important it is and not many people invest in it. Lot of people think that it’s easy, but truth is that could be complicated as many other jobs. Even making good profits as travel blogger I really woudn’t reccommend anyone to start a blog just to make money. Is like earn money being singer, you can earn cents or be a rockstar. Great post Caz! It covers almost all the alternatives. We have years of travel and hundreds of blogs on publuc blog spaces. We’ve only just started our own blog (S) and started to realize there might be a way to make some $ from our passion. Successful travelers like you guys act as inspiration for what might be and yes…we are starting to see results after almost 12 months..still a lot to learn though. Baby steps…big dreams. I have no desire to live in a developing country myself (primarily because we don’t like hot climates). I love what you said about a blog being not just a money making platform but a pillar of your strategy, and having a long term plan. I have to say that there is one travel blogger I’ve been keeping an eye on a full time travel blogger recently who seems to do nothing but constant press trips, and while it sounds glamorous when I think about the hectic lifestyle she lives and how much content she has to create in return it doesn’t really sound all that fun, to be quite honest. Wow this post is filled with so much knowledge and honesty, and actionable tips! I’m a fellow B School grad and I can say with certainty that what I learned there prompted me to make a much better income from my blogging endeavors then when I was trying to ‘monetize’ my blog. I seriously cannot believe it took me so long to realize that people were asking me for services and I hadn’t even charged them. Instead I was caught up in the sponsored post realm of travel blogging which I couldn’t scale. I then started working with a few clients via referrals, and eventually started announcing to people yup, in addition to writing I also do social media strategy. I am so happy I finally took the plunge, and now am working on my first course. I know! B-school really opens up your doors of ideas and gives you the process to implement them. IT really changed my whole strategy. So glad you were able to do the same Elizabeth! Getaway is an Australian TV travel show. This is a hell of knowledge and information for every teenager,student,housewife,unemployed ! Hi Caz! Thanks for a REAL article with honest, REAL information! I’ve been researching what feels like hundreds of travel blogger sites and none have delved into this level of detail. As an avid traveler (used to only travelling on my sacred leave days for the last 14 years), I hadn’t thought of starting a blog until a few months ago. The drag and grind of a 8-5 job just isn’t inspiring my dreams anymore and until I stumbled upon your website I really didn’t think that travel blogging was a viable avenue for alternative income or an alternative lifestyle. I’ll definitely be subscribing and look forward to reading more on your site for tips, tricks and the honest truth! I finally have a domain registered, but now to get to the hard part and bed down my blog, the value I can add and get cracking! No worries. I’m so glad we could help! It’s an amazing journey. We hope we can continue to help you with lots of tips. Great advice! I am currently on a trip around the world for a year. I am already on month five and am sad it is already half over. A true inspiration! This is such a well-written post. One small question: how do you figure out how much to ask for example for press trips, or sponsored editorials? Travel blogging is still a new media for some, and many brands will devaluate your work! What is the average pricing here? Thank you! I think it’s so nice that you’ve created this article with the sole purpose of helping others and wanting others to experience some of your success and succeed. A really nice sentiment. It’s something we have just started, we enjoy travelling and one half is a writer and one’s a photographer so fingers crossed we shall see. This is a very helpful, realistic and inspiring post. Hope I can do all these too. Thank you for sharing your expertise! I like this article and also how its augmentative and how factual situations and scenarios have been taken into account. I recently started an affiliate revenue driven travel website. The website had a search box that a user uses to search for hotel and flight deals therefore earning me affiliate revenue through leads. 100% of my revenue was generated from leads that paid between $0.75 and $2.00. In the first month I only made $3.25. Getting targeted traffic that converted well was very hard for me. However, after meeting a lady by the name Marie, on Facebook, things changed for the better. She offered me real genuine organic traffic with real computer IP addresses that really converted well. If you plan to make money with your blog that could result in taxes, should we get a business license? It’s a partnership so we wouldn’t want just one of us to end up with tax liability. What do you recommend? I recommend talking with an accountant. I don’t want to give you the wrong information. They’ll be able to help you make the right choices. I’m still quite far from the idea of earning any money from my travel blog, but it would definitely be rewarding if my blog starts providing me some small money that I could invest in my future travels. I’ll stick to all the advice you mentioned in the post above, so that results of a hard work could be seen in the future. This is something me and my family definitely want to do but are really new to it all. Were currently saving every penny we have to start our first travel with our three children in a camper van around Europe. Would you recommend starting a blog asap in time for the start of our travels? Any other advise would be awsome. As always, your article is the best..
Making your own products while growing your blog is the best way to monetize it.. The time that you are still growing your blog, think of a product that you think will sell to your ENGAGED readers. Thanks for sharing your tips to earn money from travel blog. I knew few things but not all, you have shared detailed information. I am seriously considering moving to Australia in the near future (a month or two) and have been looking in to travel blogging as a profession. I like what you said about not doing this for free trips, but because it’s something you really love. I don’t know if you do this, but I would so love to connect and maybe ask some questions if possible by email, Skype or meeting you once I move. I understand that this industry is no overnight success, but takes years of hard work, and I believe I am ready to work for it. I have a plan to support myself until I can make this dream a tangible reality. I hope to talk soon. Good timing. We’re just sharing some free training today from my business mentor and the lady who turned it around for me. You can check it out here bit.ly/1K1i7jv It’s free business training. And be sure to join our Digital Lifestyle email community. https://www.ytravelblog.com/digital-nomad-toolkit/ I’ll be sharing more about my mentoring group that opens in a couple of weeks. It’s the only mentoring I do as I get requests daily, and don’t have the time, so don’t offer anything on an individual level. Dear Caz, it’s such a pleasure to find blogs like yours! No wonder it’s one of the best-rated ones in the travel blogging market, as I found out when looking for interesting sites to learn from. You guys have such an inspiring story, thanks for sharing it with the world! I’ve just started my travel blog a couple of months ago, based on my personal experience and places I’ve visited, mainly in South America. Like many others, my goal is to make some money off my blog and, why not, achieve that “location independent” status you mentioned in other posts. Even though I can’t do it full-time right now, I’m putting every effort in this project and I’ll certainly make the most of every piece of advice you share. BTW, and just out of curiosity, did you ever worked with banner-based monetization systems (like Adsense)? It looks like the easiest way to start generating some income, but I’m not sure if it would affect blog’s reputation in any way, for example. Thanks for reading Gary. Glad it gave you a few takeaway points! I am inspired by your story. Blogging isn’t new to me, but travel blogging is. I stumbled upon this post while searching on Google about ways to monetize a travel blog. Cool tips. I have just started working on my travel blog. I don’t expect to make any money in a year or two, but hopefully things will get better afterwards. I enjoy travel writing, so I think I will have the motivation to continue. hello would you be able to take a look at my blog and tell me if it could be profitable? There’s nothing than having a cool breeze of air and educating someone half way across the world on how to be empowered financially or otherwise. Brilliant work!!! Thanks Caz. Thats a very honest article with insight on other money making avenues of travel blogging. Making money anywhere ain’t easy it requires dedication and patience. After 2 months of travel blogging i finally broke into the $200 mark last month ( I have been blogging on another niche topic since 10 months and i made $0 but it taught me a lot of things) . Was a lucky streak though, this month is halfgone and i am still on $50. I feel the key lies in publishing good quality articles and not overdoing things from the start (the mistake i made earlier) . One should start at a pace at which they can commit to even if it is 2 quality posts a month and hold onto to it for long. I am still an amateur writer so i limit my articles to 600 words which is good enough to communicate the story my readers. I do share my articles a lot on social media and that keeps the traffic coming mostly through shares by friends and family. Lets see where this approach takes me to but i plan to be in the blogosphere for a loooongg time. Thank you for this post. I am new to blogging. This was definitely a great intro to blogging. Very interesting article ! I know exactly how much it takes to get an online business going. I recently join travelpreneur.sg and they give me opportunity for earning and travel around the world. Thank you for the inspiration. I have been planning to pursue my blogging career. My blog is more than a year online and been getting decent pageviews and followers. By next year, I am planning to quit my day job and become a full time travel blogger. But I have fears and doubts if things are going to work out well. But thank you for the inspiration. I am positive again that things are going to work out for me. I am just earning 3 digits monthly, but hopefully, 6 digits later. whats a Blogger Brand Campaign? When a blogger works with a brand on a campaign! I love that the entire community really tries to assist and encourage others in living their dreams. Here is a little list that we put together to help people in making money from the road, although it is much less comprehensive than yours! We had never thought of public speaking! I would like to read your information and experience, I live in a nursing home and can still get around but not well enough. I have traveled in Australia a lot and a bit of an Aussie character about me having worked on big properties mustering on horses and choppers, when I was only 14 so I tend to fit in. I wish you all the best in your travels thank you Norm. Great post! 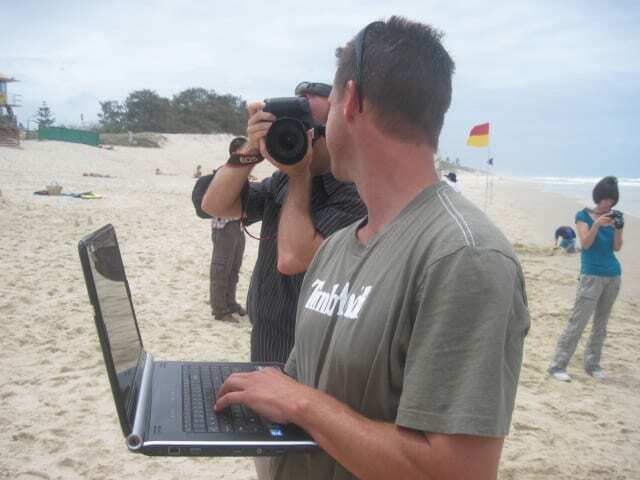 Very useful information for new travel bloggers. Thanks for sharing! Have you had much success with Youtube? I’m aware that video is going to be the future of online media. I read somewhere that video will be 75% of online traffic in a few years. I know many travel bloggers, but are they really making much money with Youtube? Also, I am considered about Youtube owning my content and possbily suspending my account for no reason. The lack of control bothers me, but the # of eyeballs on Youtube is staggering! Your comment about a TV show is interesting. How would you approach a strategy geared towards travel video content? Would you use Youtube or host the videos on your own website? This is incredibly helpful and insightful! Thanks so much for taking time to write this. Growing frustration with my desk job had me thinking “what about travel blogging?’ but with only fantasy thoughts and no solid understanding of what goes on behind it, I channeled my google-fu and found you. I certainly have a lot to consider before I venture forth. This post opens my eyes. Thank you very much, Caz. I’ll see you in your marketing course. Thank you for good resource. I’m trying to make money from my website and looking for some resources like this. WOW so many useful resources here!! thank you for putting it all together. Wishing you both all the best on your future adventures. An amazing article thank you very much it helped me a lot. Great article! I’m a financial and marketing writer and ghostwriter who loves to travel, and found this googling, as I wonder about combining them. Right now I am spending 33 days in Hawaii, was determined to not have another dreary Washington state winter! I can see how I could use a travel blog or travel related business to at least write off all of my travel expenses, which would be a big help. And it’s also worth noting – if you can become location Independent in your work, you can travel anywhere you want, whether or not you get paid to do that, or paid to do the other thing you do from your laptop anywhere in the world. Thank you for the great tips. I think you have done a pretty amazing job of creating your brand. I actually heard about your blog for the first time when I attended a Travel Massive networking evening in Sydney, and was told to aim to have a blog like yours. I only started my blog in April so I still have a ways to go in order to start making any money off it. really opened my eyes, being a travel blogger is not as easy as turning the palm of the hand. it takes persistence to achieve all that. Thank you for the great tips. I think you have done a pretty amazing job of creating your brand. Thanks for writing helpful information, which is going to lead me step by step towards achieving successful work on travel bogs. Thanks for writing such informative information. It’s super helpful in looking for ways to travel and blog. Thank you for this amazing article. Very helpful to those who are looking for ways how to earn from blogging. I’m a blogger for 12 years now but still can’t leave my day job even if I wanted to since I’m not yet earning successfully in my travel blog. I feel like there is reallly good info here, but honestly I couldn’t concentrate for the amount of moving ads. There is one on the bottom and one on the right and its really challenging to read with so much flashing and movement. Glad you found the content useful Alyssa. As for the ads, you can X them out, well you should be able to. Just stumbled across this! I am just trying to learn more about how I can make my blog profitable. Thank you so much for the insighhts! Totally agree! I started my travel blog in 2016 and it’s been quite an interesting journey. As many of you, I didn’t start to make money with it, however in the past year it has become a notable source of income and a “learning experience” allowing me to get into other online business models. I think the key to success if you are trying to make some money with your blog is going “niche” and becoming a pro at keyword research, learn and apply SEO techniques and definitely don’t focus on ads at the beggining, it just won’t work like that. Cheers and keep it up!